Think about how much plaque and tartar would build up on your teeth if you never brushed them or went to the dentist. This is a fact of life for most pets, which is partly why 85% of them have some form of dental disease by the time they reach 4 years of age. But this doesn’t have to be the case. Beverly Hills Veterinary Associates recommends you start with a clean slate, so to speak. Call us to schedule your pet’s professional dental cleaning. This lets us remove years of plaque and tartar buildup, evaluate every tooth in your pet’s mouth to make sure no bacterial damage has occured, and to extract any teeth that cannot be saved. Just as people, pets should have regular dental cleanings. But daily brushing can also help keep dental disease at bay. Ideally, brushing your pet’s teeth should begin when they are young. Just as in children, the earlier you start, the more comfortable your pet will be with the process as they age. But older pets can still learn to tolerate and even enjoy having their teeth brushed. Here’s how. Each of these steps should be performed on a different day. End each tooth brushing session on a positive note. Finally, keep at it! Some pets may take some time to get used to simply having their mouth handled. It may take patience, but the payoff will be a healthier mouth and longer life for your pet. Keeping your pet’s teeth clean requires a commitment on your part. We’ll do our part to help, and are happy to answer any questions you might have or give you a tooth brushing demo in our office. 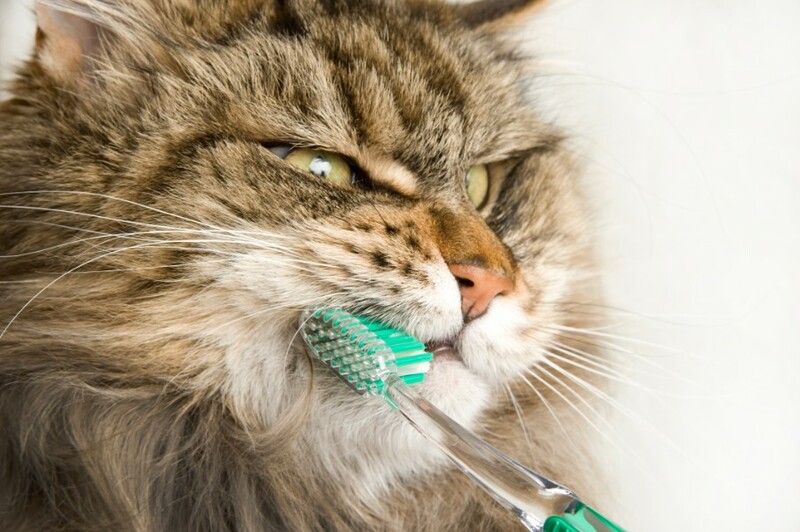 Please give us a call if you have any questions about brushing your pet’s teeth.